Last night at the Palais Brongniart, the cinema magazine Le film français handed out the awards for their 19th Trophées du Film français. The controversial hit Intouchables (Untouchable) by Olivier Nakache and Eric Toledano led the field with three awards. It won the the Trophée du prix du public TF1 (Audience Award) determined by an online vote, Trophée du Film français for French film with the highest box office, and the Trophée des Trophées (Trophy of Trophies) for the highest box office from films of all nationalities. The film tells the story of a poor black man Driss from the housing projects in northern Bondy (played by Omar Sy) who is hired to provide care for a rich white quadriplegic (François Cluzet). It was a huge surprise hit in France but received poor reviews, particularly from American critics. Jay Weissberg of Variety wrote that it "flings about the kind of Uncle Tom racism one hopes has permanently exited American screens. Driss is treated as nothing but a performing monkey (with all the racist associations of such a term), teaching the stuck-up white folk how to get 'down.'... It's painful to see." This polarization between public and critical reception is similar to the divided opinion of The Help. 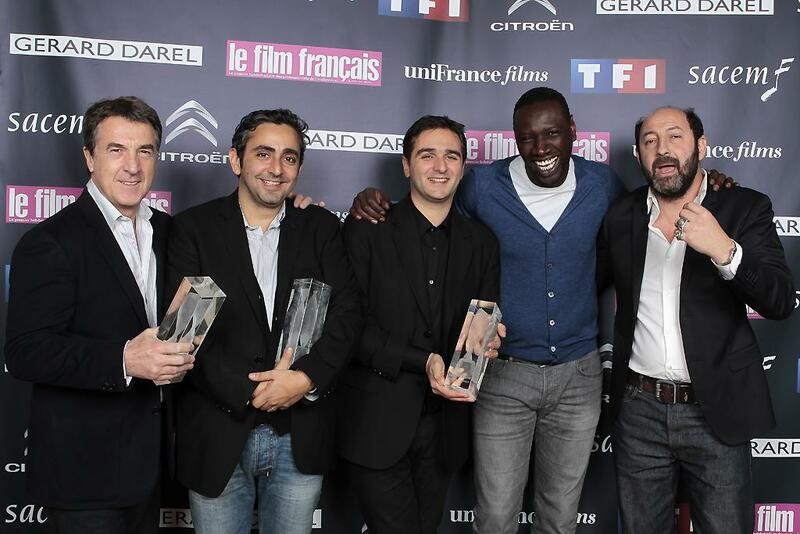 Dany Boon's Rien à déclarer (Nothing to Declare) claimed the Trophée Unifrance Films for French film with most success abroad, while Case départ (Back to Square One), by Thomas Ngijol, Fabrice Éboué and Laurent Steketee won the Trophée de la première œuvre for their debut film. Awards for director-producer duo went to Michel Hazanavicius and Thomas Langmann for The Artist and debut filmmakers Alix Delaporte and Hélène Cases (Lionceau Films) for Angèle et Tony (Angèle and Tony). The jurors for the Duo Trophées were Sophie Deschamps (SACD), Cécile Felsenberg (UBBA), Yaël Fogiel (Les Films du Poisson), Laetitia Gonzalez (Les Films du Poisson), Daniel Leconte (Film en stock), and Grégoire Melin (Kinology). A jury comprised of Anne-Françoise Bélier (Metropolitan Filmexport), Daniel Chabannes (Epicentre Films), Nathalie Cieutat (Wild Bunch Distribution), Henri Demoulin (Pathé Distribution) and Aurélie Pierre (SND) chose Richard Derobert of Cinéma Mégaroyal in Bourgoin-Jallieu as the recipient for Theatre Operator. Costa-Gavras received an Honourary Award for his career achievement, while public voting declared Polisse director Maïwenn to be the Personality of the Year. Trophée du film français majoritaire français en langue française, ayant attiré le plus grand nombre de spectateurs en salle à l’étranger en 2011.